As such, it is decided to start the process of making admissions into the above stated upgraded Residential Junior Colleges from out of the existing TSRJC CET-2017 merit list. While short listing the candidates in 1:5 ratio, the candidates, who were shortlisted for I phase Counseling held on 21.05.2017 & 23.05.2017, but could not secure admission are also considered. 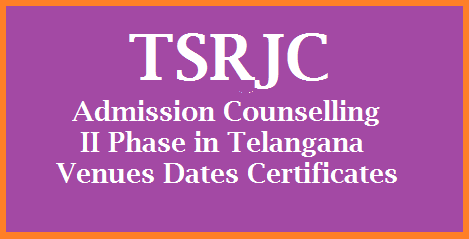 It is also decided to hold Counseling on 19.06.2017 for boys both MPC & BPC at TSRJC, Sarvail; and for girls on 19.06.2017 for MPC, and 20.06.2017 for BPC at TSRJC, Hasanparthy, Warangal(U) district. The shortlisted candidates have to bring the result sheet downloaded by them, to attend the admission counseling along with original certificates listed below. Candidates are called for admission counseling in the ratio of 1:5 in all the categories to the available seats. Hence, admission is not assured for all shortlisted candidates. Admission will be provided based on the merit, rule of reservation. The candidate must have Passed in the qualifying examination in the first attempt in March 2017. OC candidates must secure minimum of GPA 6 and BC, SC, ST candidates must secure minimum of GPA 5 in SSC or equivalent Examination. Telugu Medium candidates opting for English Medium should get minimum of GPA 5 in English subject in their qualifying examination i.e. SSC. Original pass Certificate of SSC or its equivalent Exam and Marks Memo/ at least internet copy. Physical Fitness Certificate from Medical Officer not below the rank of Civil Assistant Surgeon. Three Sets of photocopies of all the above certificates.